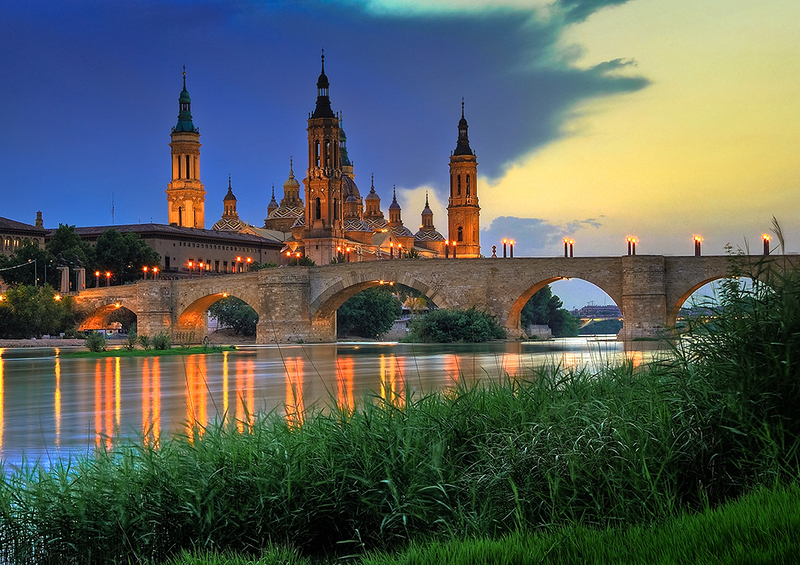 Zaragoza is the fifth largest city in Spain and the capital of the autonomous community of Aragon . This beautiful city, sometimes known as ‘Saragossa’ in English, sits beside the Ebro, which is one of the most important rivers in the Iberian Peninsula. It is known for its wealth of historical sites, which date as far back as the Roman Empire, as well as its role as the host city of the Expo 2008 international exposition. Around 14 BC, Augustus , the founder of the Roman Empire, founded the city Caesaraugusta, which is thought to have evolved into the city’s current name, Zaragoza. In the 8th century, the city fell under the control of Muslims, who renamed it ‘Saraqusta’, eventually becoming the largest city controlled by Muslims in northern Spain. Centuries later, the city was conquered by the Aragonese, who made it the capital of the Kingdom of Aragon, which later became part of what is now the Kingdom of Spain. 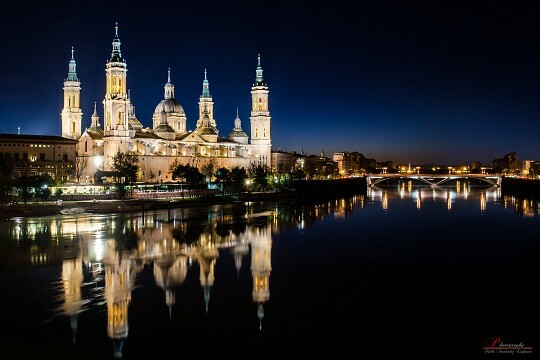 There are tons of fascinating places to visit in Zaragoza, including religious sites, historic buildings; architectural wonders, museums; parks, gardens; and plazas. Zaragoza’s most famous landmark is the Catedral-Basílica de Nuestra Señora del Pilar, a Baroque-style Roman Catholic church. The Basilica of our Lady of the Pillar is thought to be the first church in history to have been dedicated to Mary. According to local tradition, Saint James saw a vision of Mary in 40 AD while he was in Spain preaching the Gospel, and she instructed him to build a church on that exact spot by the Ebro River. 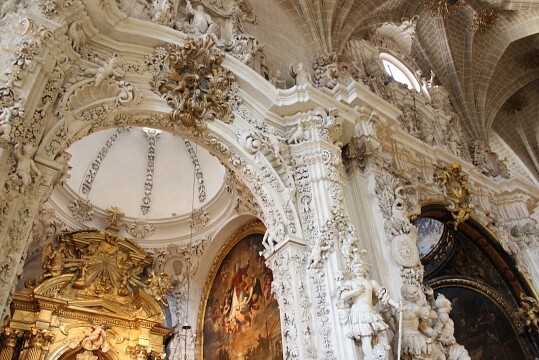 Over the centuries many Christian churches have resided in this location, including the current immense basilica, which was constructed in the 1680s under the orders of King Charles II of Spain. The basilica shares the title of Cathedral of Zaragoza with the adjacent La Seo Cathedral. Its most famous artifact is a wooden statue of the Virgin Mary which sits on a column made of jade. It is said to be the same statue that Mary gave Saint James centuries ago. The basilica’s ceilings are another important feature, since they are covered in beautiful frescoes painted by renowned Spanish painter, Francisco Goya . On the same plaza, you will find the beautiful La Seo Cathedral, also known as the ‘Cathedral of the Savior’ in English. It is located on the site of the ancient Roman forum of Augustus. It is especially remarkable due to the fascinating combination of architectural styles it features due to various expansions throughout the centuries. Some of its most famous elements include its Romanesque apse, its Baroque tower, its Neo-Classical main door, and its Gothic altarpiece. Several areas of the church also represent the Mudéjar style, which led to its inclusion in the Mudéjar Architecture of Aragon UNESCO World Heritage Site. The Aljafería Palace is also part of the Mudéjar Architecture of Aragon UNESCO World Heritage Site. It is a fascinating, fortified, medieval Islamic palace that was used when Spain was ruled by the Moors and known as ‘Al-Andalus’. 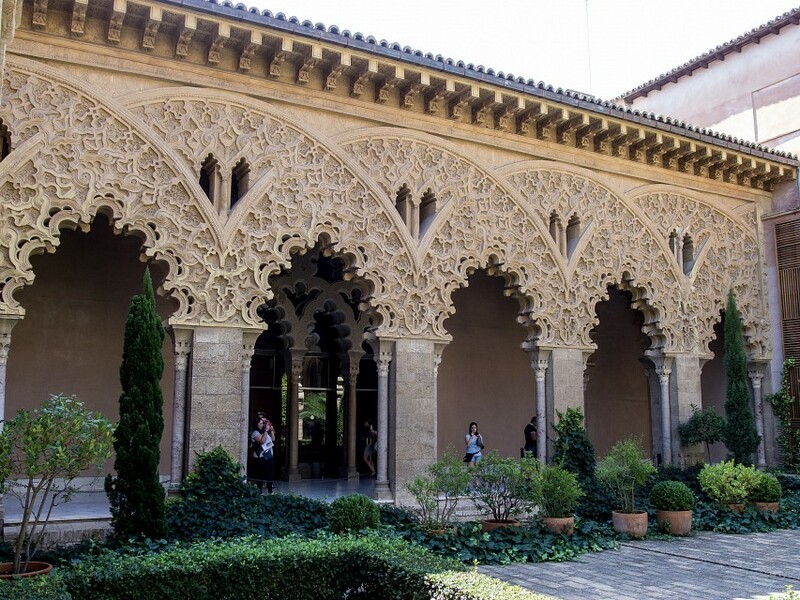 The palace is especially remarkable because it is such a large example of Islamic architecture from that period. After Zaragoza was captured by King Alfonso I of Aragon, it was used as the residence of the rulers of the Kingdom of Aragon, including the Catholic Monarchs. It is currently used by the regional government of the autonomous community of Aragon. The Puente de Piedra is a 15th-century stone bridge that crosses the Ebro River in Zaragoza. It features four sculptures of lions that sit atop pillars on each end of the bridge, since the lion is the symbol of the city. It provides beautiful views of the river as well as many of the city’s famous landmarks, including the co-cathedrals. Museo Pablo Serrano, officially known as ‘Instituto Aragonés de Arte y Cultura Contemporáneos’, is a modern and contemporary art museum which features pieces by artists from around the world such as Pablo Picasso, Andy Warhol, and Alexander Calder, as well as a large collection of sculptures by famous Aragonese sculptor, Pablo Serrano . The museum building itself is also considered by some to be a work of modern art due to its unique design. While it’s worth visiting CaixaForum Zaragoza just to see the intriguing modern architectural design of its building, it’s also a popular attraction in Zaragoza due to its use as a cultural center. Founded by the Spanish bank, La Caixa, the center showcases temporary exhibitions related to art and culture. It’s free to explore most of the building, but if you want to check out the exhibitions, the adult admission price is approximately €2 ($2.30). One of the most popular gathering places in Zaragoza is Plaza del Pilar, a large plaza that is located in front of the city’s two cathedrals. It is often used for public events due to its location near the city’s most famous historic buildings and its city hall. It is also the home of a beautiful monument dedicated to Spanish painter, Francisco Goya, and the Fuente de la Hispanidad; a large fountain dedicated to Hispanic cultures that features a map of Latin America. The Plaza de Aragón, located at the end of Paseo de la Independencia, is another famous plaza which features a large monument dedicated to Juan de Lanuza, a historical figure who was killed by the troops of King Philip II of Spain in 1591. In 2008, Zaragoza hosted Expo 2008, an international exposition that focused on the theme “Water and Sustainable Development”. Millions of visitors came to Zaragoza for the exposition, which featured a wide variety of exhibits in pavilions designed by numerous countries and organizations. Today, what remains are a number of fascinating modern buildings that can be visited, including the iconic Pabellón de España, which was designed to look like a poplar forest. Other fascinating constructions include the beautiful Pabellón Puente, a covered bridge that represents a gladiola leaning over the Ebro, and the Torre del Agua, now one of the city’s largest buildings, which was designed to resemble a water droplet and contains a bar that provides panoramic views of the city. You can also visit the Parque Metropolitano del Agua, also known as ‘Parque del Agua Luis Buñuel’, which has beaches, boats, a train, and all kinds of other exciting activities that are perfect for families. It is also a great park for nature lovers due to the wide variety of birds that live there. Before Expo 2008, this was the city’s largest park. It is the perfect place for a leisurely stroll due to its expansive green spaces and impressive monuments, such as the large monument to the Aragonese king, Alfonso I, who took Zaragoza from the Moors in 1118. It also contains the city’s botanical garden, known as the ‘Jardín Botánico de Zaragoza’ in Spanish. The city’s biggest event is the Fiestas del Pilar , an annual festival held each October in honor of Our Lady of the Pillar, the city’s patron saint. Events include offerings of flowers and fruit, fairs, bullfights, concerts, and parades of people dressed as gigantes y cabezudos, traditional giant costumed figures with paper-mâché heads that are a sight you won’t want to miss. 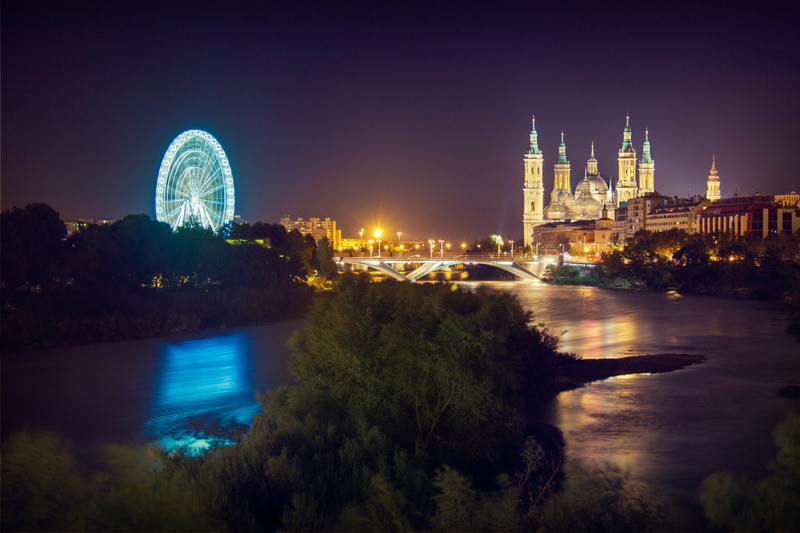 Zaragoza has a wide range of restaurants, but is primarily known for its many tapas bars, where you can enjoy small plates of delicious food along with a small beer, known as a ‘caña’ in Spanish. Popular local dishes include migas a la Aragonesa, which consists of bread crumbs with scrambled egg and chorizo, delicious sausages known as ‘longanizas’ and ‘chorizos’, and lomo de cerdo a la Zaragozana, a traditional pork cutlet dish. There are all kinds of accommodation in Zaragoza to choose from, including cheap youth hostels and luxury hotels. Hostels generally cost between €10 ($12) and €20 ($23) per person per night, while budget hotels average about €50 ($58) and luxury hotel prices start at about €80 ($92). Most streets in the city center feature shops, especially around the Plaza de España. Luxury shops can be found on streets such as Calle de Francisco de Vitoria and Calle de Isaac Peral. If you’re interested in perusing an open-air market, head to Mercadillo de la Romareda, while you should visit the immense Mercado Central if you’re looking for fresh produce and meat, as well as traditional items from Zaragoza. The city also has several shopping centers, including Centro Comercial Gran Casa, which has shops, restaurants, a cinema, and a bowling alley, Centro Comercial Augusta, and Puerta Ciniega, which has popular stores and numerous restaurants. 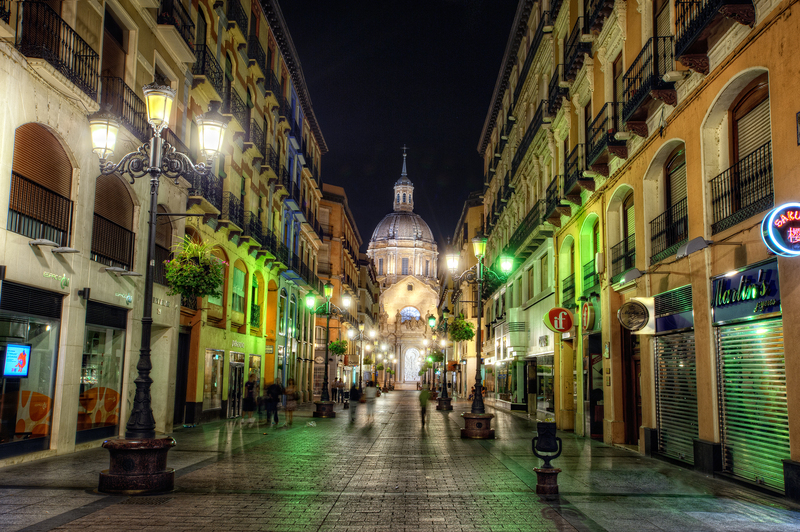 Zaragoza is a very walkable city, so you shouldn’t have much need for public transportation. That said, the city does provide an urban bus service that is relatively cheap and easy to use. There are also numerous taxis, which are generally driven by honest drivers who will not charge unreasonable fares. In terms of getting to and from Zaragoza, it can be reached by bus from many major Spanish cities. It also has a large train station that provides train services to cities like Valencia and Bilbao as well as high-speed trains to Madrid and Barcelona, which both take about 1.5 hours. There’s not much need to worry about crime in most Spanish cities, including Zaragoza. However, theft and pickpocketing does sometimes occur, so make sure to always keep your belongings with you. It’s also a good idea to hold onto your purse and keep your wallet in a front pocket.